Tory leadership contender David Davis has said he is seeking to attract the "wristband generation" of younger voters to make the party electable. He would aim to form a government that "hates injustice as much" as them, he said in a speech in Maidstone, Kent. Rival David Cameron has warned that Mr Davis's "right-wing, core-vote" strategy to become leader would mean another defeat at the next election. The party's 300,000 members have a month to vote in the contest. Mr Cameron, who at 39 is 17 years younger than Mr Davis, has positioned himself as the "change" candidate. But in his speech, Mr Davis said: "I want to win the wristband generation for the Conservative Party. "This is the generation who wears the 'Make Poverty History' wristbands. They display their intolerance of racism with their white and black bands. "The blue bands have raised money to highlight awareness of bullying. "This generation wants a government that hates injustice as much as it does. I will deliver that government for them. A Conservative government." At the weekend, Mr Cameron said a Tory government would be more likely if he was leader. He argued that the party needed to change: "If we play the same tunes, we end up with the same song, we'll end up with the same position in the charts - second." He said: "We need this intellectual revolution in the party to really do the long-term work that will help convince people that the Conservative Party has understood why it has lost," he said. He would give a clear sense of direction during the leadership campaign, and bring in the "best brains" to carry out policy work. Mr Davis told GMTV on Monday: "I grew up on a council estate, I went to a local state school. "But I was lucky, it was a good school, the teachers were good. I was able to make use of that. "A lot of kids who live there now haven't got that option and I really want to make sure that that is available to everybody." Mr Davis again hinted at his younger, Eton-educated opponent's "image-led" policies, and said the public wanted to get away from the world of spin. He said: "We have got to be principled, very straightforward, what-you-see-is-what-you-get politics, less media manipulation, less obsession with image - bluntly - and all of those things I think I characterise." 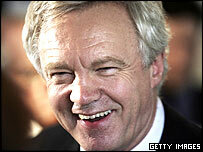 Mr Davis said if he became the Tory leader, he was most likely to face Gordon Brown as prime minister. He added: "I'll tell you what the hardest outcome is. If Brown gets in with six months to go and is still in a honeymoon - that's the real tough outcome." Conservative members have until 5 December to vote, with the result announced the next day.